Yes, here on Cape Cod we are famous for the Cape Codder. We’re happy to tell you where you can go to get one. In fact it would actually be harder to tell you a place that you can’t get one on Cape. We also want to share more. Specifically the amazing beer, wine and cocktail selections available right in our backyard as well as the ones that are worth the drive! Father’s Kitchen and Tap House, East Sandwich: This is a fairly new addition to our little part of the Cape and we have welcomed them with open arms for a reason! And that reason is beer. 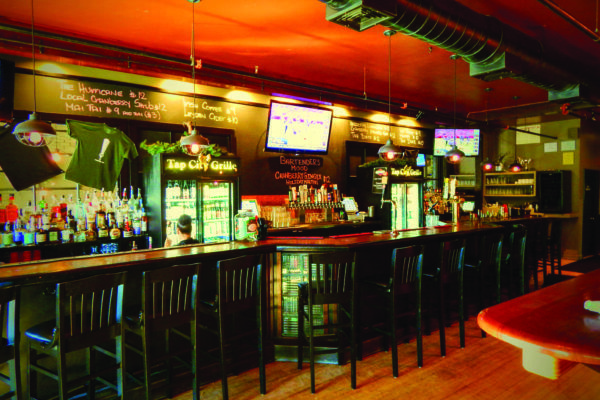 Father’s offers 42 amazing beers on tap both local and from afar. Our favorite thing to do there? A flight. Belly up to the bar and ask for a flight sheet. You’ll be able to take a look at a description of every beer. Most beers are offered in a full pour, half pour, or a flight. The bar tenders are also super helpful and knowledgeable. If you know you like IPA’s but aren’t sure if a Pale Ale would excite and delight your taste buds, just ask them. They’re happy to help steer you in the right direction and can also make some suggestions about new fun and interesting beers to try! Bonus: Great food! Insider Tip : A recommendation is for you to try the peanut butter pizza. No, it’s not dessert (though you can totally order it as dessert) – but it is incredible. And it goes great with beer! British Beer Company, Falmouth, Hyannis and Sandwich: When beer is right in the name of the restaurant, is there really more explanation necessary? With 14 locations around MA, we’re lucky enough to have three right here on Cape Cod. This means no matter where your Cape Cod travels take you, you’re never very far away a good beer. In addition to a bunch of great beers on tap, depending on location, they also have beers on cask and will fill growlers! Check out each individual website or Facebook page for live music, trivia, and more! Devil’s Purse Brewery, West Dennis: This is a Cape Cod gem. If you’re looking for an amazing local brew born from an incredible local story, look no further than Devil’s Purse. 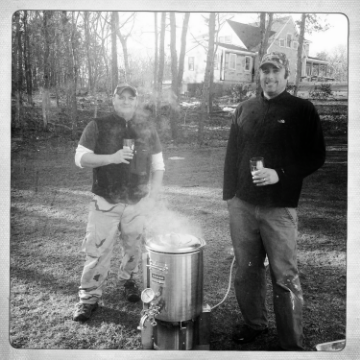 Matt and Mike, owners and operators began what would later become Devil’s Purse on a total whim. They made a batch of beer from a beer making kit one of them had gotten as a wedding gift nearly 10 years prior and as they say, the rest is history. Well, the rest was a ton of hard work, trial and error, grit and determination – but their efforts taste amazing! At the brewery, you can do tastings, buy beer and swag and of course, chat with Matt and Mike – they’re always there. Mark our words, this brewery is going to blow up and when it does, how cool would it be to say “I knew about Devil’s Purse back when it was just Matt and Mike, brewing and chatting all day long!” Insider Tip: Ask the guys for restaurant recommendations in the area if you’re in around meal time. They have tried everywhere and will be able to give you a great heads up – and killer hole in the wall places are their specialty! The Landing, Woods Hole: Talk about a drink with a view! At The Landing you can sip your cocktails as your legs dangle off the dock. Of course they have a full bar, but there’s one cocktail you simply can’t leave the Cape without trying and it’s called a Greyhound. You may have heard of it; you may have even had one before… but you haven’t really had one if you haven’t had one from The Landing. The ingredients are simple, and sometimes simple makes the best drink. It’s fresh squeezed grapefruit juice, vodka and maybe a splash of soda water. The key to this drink lies within the fresh squeeze. They have this antique looking Greyhound-specific contraption with one purpose: to squeeze grapefruits. Watching the bartenders (who probably have huge muscles after the summer’s up) squeeze fruit after fruit all for your drink is one of the coolest things to see. Pan D’Avignon, Hyannis: Don’t be fooled by this restaurant’s unassuming exterior. We and many others view Pan D’Avignon as one of the best French restaurants on the Cape. Their martini menu is something to go back for. One of the most interesting elements of the decor is the exposed (giant) wine cellar. They have some of the best wines on Cape Cod. Half the fun is to watch the sommelier head into the cellar and procure your bottle. BUT, there is one thing in particular that we need to let you in on. That is that this is the place where you can get year round, handmade bleu cheese stuffed olives. This may not sound groundbreaking, but when you add them into your favorite dry cocktail (like.. oh I don’t know, maybe a slightly dirty Tito’s vodka martini with two bleu cheese stuffed olives… just you know, off the top of my head) you’ll understand why they’re worth the mention. More of a gin an tonic or wine person? No worries! Order a few olives on the side. The local bleu cheese paired with the saltiness of the olive is something to behold. Ocean House, Dennisport: The Ocean House is a fabulous place for dinner and absolutely a favorite for people visiting the Cape. 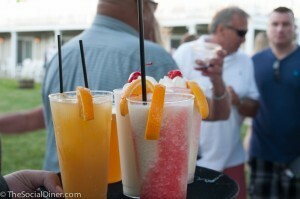 The Ocean House Beach Bar (on the same property) is the place to go for frozen cocktails. Mudslides, Daquaris, Pina Coladas – you name it, they’ve got it. They’ll even do one of my best friend’s favorites a Miami Vice which is 50% Pina Colada, 50% Strawberry Daquari and 100% delish! They frequently offer live music right on the lawn, which always makes your sipping experience that much more enjoyable! The Beachcomber, Wellfleet: Lunch, dinner, late night menu – regardless of the time of day, The Beachcomber is sure to have the food and beverages you’re looking for to really enjoy your time on the Cape. Their raw bar is stocked from local fisherman, and you can really taste the difference. Like any good bar and restaurant on the beach, the comber has frozen beverages, beers galore, wine and an extensive cocktail list. Insider Tip: They’ve got something no one else does. And it’s called a Goombay Smash. Their website divulges that it includes rums, juices and a myers float. BUT, no one can come close to reconstructing this masterpiece. One sip, and you’ll understand why there have been over 3 million sold!